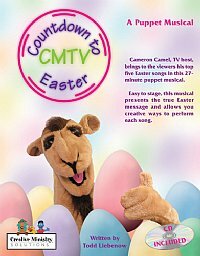 TV host Cameron Camel shares the Top Five Easter songs with his audience in this 27-minute puppet musical, written by Todd Liebenow. If the title sounds familiar, it may be that you remember our 'Countdown to Christmas' musical. This musical includes four main characters: Camel, Paperboy, Egg Salesman and Female Cleaning Expert. The announcer can easily be an offstage voice or male puppet if you prefer. You will also need a Rabbit puppet for the Bunny Song. The five songs in the musical provide opportunity for you to creatively present each musical message. The CD/script book provides some production tips for each song. Cameron Camel does a great job of presenting the real Easter message with his comments and introductions between each song. All the songs and the lyrics also tell the biblical Easter story.